This was the Seat of Sir Robert Grosvenor, Baronet. The estate was three miles from Chester. It was first acquired by the Grosvenor family in the 15th century. The first house was built here between 1673-83 to a design by William Samwell. In c.1802 Grosvenor became the 1st Marquis of Westminster and employed William Porden to rebuild the house. 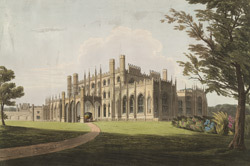 The rebuilding took place between c.1802-12. As can be seen in this view it was rebuilt in spectacular Gothic style with arched windows, battlements decorated with delicate pinnacles. This building is no longer standing- by the mid 19th century Porden's delicate, frilly style of Gothic was considered old fashioned. In the 1870s it was rebuilt in a more solid, heavy looking Gothic Revival style, designed by Alfred Waterhouse. This house lasted until the 1960s when it was replaced with a modern design.